This high energy, hilarious musical tells the story of a down on her luck laundress named Cindy and the colorful guardian angels who come to teach her about finding true love. 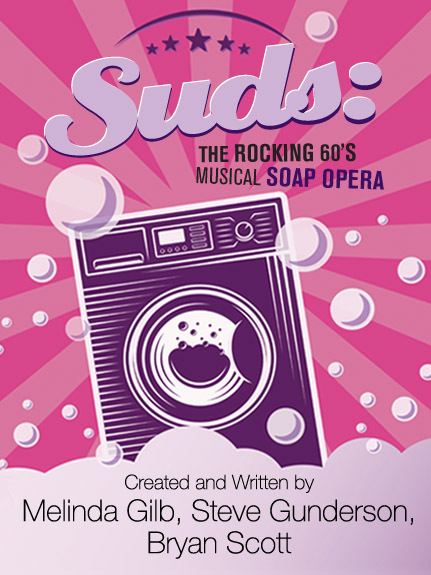 SUDS is loaded with good clean fun, bubbling energy and over 50 well-known songs that topped the charts in the 1960s, including “Please Mr. Postman,” “Johnny Angel,” “Chapel of Love,” “Walk on By,” and “RESPECT.” SUDS has toured the country, receiving rave reviews and breaking box office records, so invite some friends and get ready for an incredibly fun night of theatre. *Member, Actor’s Equity Association, the union of professional actors and stage managers in the United States. Click on a show in color for its details. The only year-round professional theatre company in Santa Cruz.